The Sikh conclave, convened by the SGPC here today, served an ultimatum on the state government to withdraw criminal cases against Giani Balwant Singh Nandgarh, Jathedar Damdama Sahib, and his associates who had gone to stop the sacrilege of Guru Granth Sahib at Baluana or face a protest march by the Sikh sangat. seed-producing and selling companies to slash the seed price have finally paid off. The firms have agreed to cut the price of the seed, depending on its variety, by Rs 300 to Rs 375 per packet of 450 gm. Under the galliara beautification project, the authorities demolished the century-old Panna Lal Jain Haveli near Harmandar Sahib in the presence of a heavy police force in the wee hours today. Some officials of the Transport Department, Sangrur, played spoilsport in the marriage ceremony by “compelling” the members of the marriage party to alight from the two buses they were traveling in before impounding both the vehicles. At a ceremony at the House of Commons of the UK last evening, organisations and individuals, who have made outstanding contribution to Punjabi art, literature, sports and values were honoured by the All-Party Parliamentary Group on Punjabis. 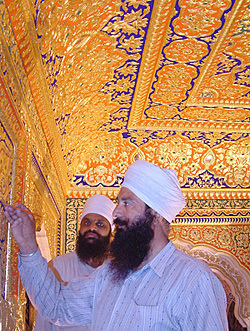 The four-century-old Darbar Sahib is glittering more than usual. With almost 3 quintals of gold (about Rs 2.40 crore) used for gilding, first time after Maharaja Ranjit Singh, it is the second Sikh shrine after the Golden Temple where a huge quantity of gold has been used. Congress President Sonia Gandhi’s decision to quit her Lok Sabha membership and the National Advisory Council could not be termed as renunciation as she did it under pressure from the Opposition, state BJP chief Avinash Rai Khanna said while interacting with mediapersons here today. Out of about 25,000 schoolchildren, examined under the School Dental Health Programme by members of the Indian Dental Association (IDA) in the Sangrur district recently, about 70 per cent children, especially in the rural areas, have been found suffering from various dental diseases. The Durgiana Management Committee, which forcibly took over the management of the historical Durgiana Temple yesterday, would make the inventory of toshakhana. A new born girl was allegedly abandoned by her mother at the local Mata Kaushliya Hospital, today after the mother, along with her relatives, left the hospital without taking the child along with her. 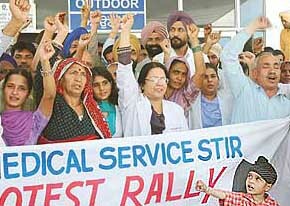 Students of various medical colleges held demonstrations at their respective institutions to protest the state government’s decision to hand over these institutions to private societies. Water in the Madhopur headworks has been stopped after about 15 years for repairs in gates and renovation. Earlier, the water at the head was stopped in 1991-92 for minor repairs. Close on the heels of security concerns over the satellite imagery of important airbases in North India on a website, residents of the cantonment here are perturbed over the installation of a telecom tower in the cantonment. Much has been talked about the interest of Prince Charles in organic methods of farming adopted in Punjab. However, the fact is that there is no agency in the state to certify the produce as organic. This is a major handicap faced by the farmers interested in organic farming. Faulty sewerage of Pathankot has contaminated underground water in many areas. Hand pumps installed in houses are pumping out contaminated water. Rosy, a resident of Sarain locality, said the hand pump had been installed in their house at a depth of about 30 ft. It pumped out black water that is not fit for consumption. The other residents of the area also said they had stopped using their hand pumps. Up in arms against police authorities for not arresting a retired police inspector, who had thrashed a Scheduled Caste woman and abused her last week, hundreds of residents belonging to Valmik community of Jora village blocked the busy Jalandhar-Pathankot national highway for over two hours near here today. There is resentment among employees against the Punjab government for having failed to fulfil promises made to them during Assembly elections. As many as 199 pilgrims from Pakistan, who came to pay obeisance at Rauza Sharif were felicitated on the concluding day of three-day annual Urs by the District Administration today at Aam Khas Bagh. In an effort to improve the water supply in Patiala, the Patiala Urban Planning and Development Authority, at its meeting here today, approved to install 20 deep tubewells in the city. The Punjab Chief Minister, Capt Amarinder Singh, today launched the Sanjivni Healthcare Scheme in the state, the first of its kind in northern India. The scheme has been floated by rural cooperative societies of Punjab. The Punjab Chief Minister, Capt Amarinder Singh, today expressed grief over the death of Mr Bansi Lal, a former Chief Minister of Haryana. Punjab Urban Development and Housing Minister Raghunath Sahai Puri distributed cheques worth Rs 21 lakh among 17 gram panchayats of Dhar block in the Sujanpur constituency for carrying out developments speedily here on Tuesday. The Consumer Court, Hoshiarpur, has accepted the complaint of Pawan Kumar of Abadgarh village (Gurdaspur) and has instructed the Head Post Office, Mukerian, to pay Rs 9910 to the complainant. The Punjab Chief Minister, Capt Amarinder Singh, is expecting an increase in the minimum support price ( MSP) of wheat soon. A land dispute between two brothers has led to the murder of one of them. According to police sources, Gurmeet Kaur, wife of Kulwinder Singh of Dhamina Kalan, stated that her husband had gone out on a cycle on the March 27 evening but did not return home. The Railway police stationed at Rajpura today arrested two thieves and recovered Rs 2 lakh from their custody. Ex-serviceman Satnam Singh (62) was killed and his wife, Amarjit Kaur, injured when armed robbers attacked their house last night. The number of robbers is said to eight. Two persons were injured in an accident involving four vehicles on the national highway near Sunny Enclave here this evening. Mr Rajat Mehta, a resident of the enclave, said a truck coming from Mohali collided with another truck near Gilco Valley colony. The Centre for Buddhist Studies and Guru Gobind Singh Department of Religious Studies, Punjabi University, yesterday organised a UGC-sponsored national seminar on “Buddhism in Punjab: Past and Present”. Classes for the past week at Baba Banda Singh Bahadur Engineering College were affected due to the visit of Prince Charles as two helipads were made in the college campus and police guarded these pads by erecting tents at least seven days before the dignitaries arrived. Students of the final year of graduation of SR Government College for Women who had not been issued roll numbers staged a dharna along with their parents in front of the college here today. A deputation of doctors and other employees of the Punjab Government medical and dental colleges here today met the Chief Minister, Capt Amarinder Singh, to oppose the handing over the management of these colleges to proposed societies. Ms Isher Judge Ahluwalia, Vice-Chairperson of the Punjab State Planning Board, delivered the inaugural Amardeep Memorial Lecture on “Punjab economy: challenges ahead” organised at Guru Nanak Dev University here today. Students of Guru Gobind College of Modern Technology staged a dharna in protest against the alleged indifferent attitude of the teachers. Students even shut the gate of the college and did not allow teachers to move out of the institute. This went on for quite sometime till the police intervened and got the matter sorted out.